For the most part, we avoid Subversion branching and merging, so I optimize for working in trunk. Forget about using Git push and pull for collaborating with others. git-svn stores extra metadata that isn’t pushed with the rest of the repository, so git-svn operations will fail on cloned repos. Furthermore, each repository’s git-svn commits are unique, so pulling from another repository will fetch its parallel history (if you have to do this, git rebase -i can help filter out the overlapping commits). That said, I do use push/pull to collaborate with myself across machines, though I always operate against Subversion from one machine. All substantial work is done in local topic branches, with master reserved exclusively for tracking what’s in (or to be immediately committed to) Subversion. 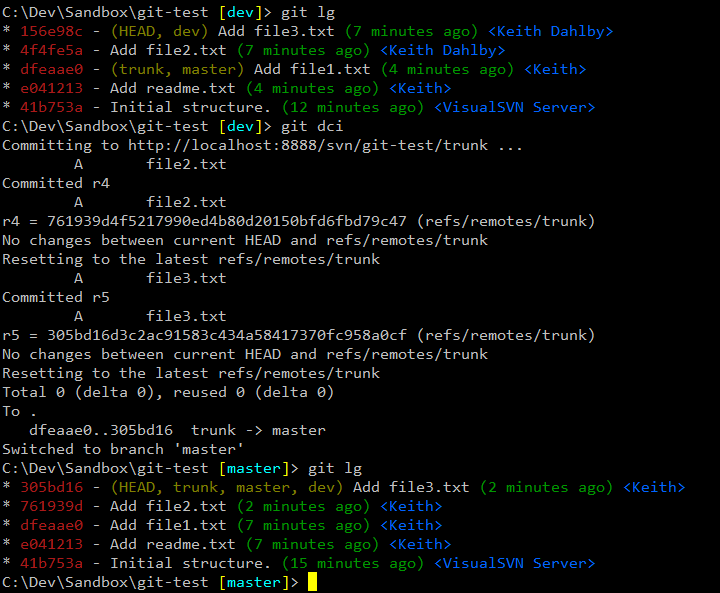 git config alias.up "!git svn fetch && git svn rebase -l && git push . 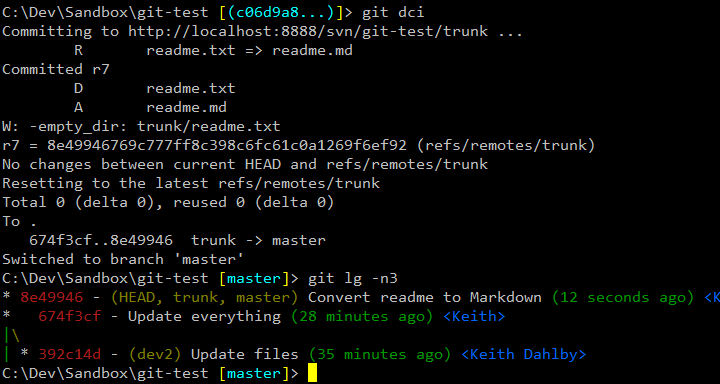 remotes/trunk:master && git push -f origin master"
Fetch the latest from Subversion. I use svn fetch instead of svn rebase because the former also fetches from Subversion branches; we’ll do our own rebase later. Rebase my current branch against its Subversion parent. -l skips a remote fetch, since we just did one. Update my local master branch to match Subversion’s trunk. If you didn’t use --std-layout, you might need to replace remotes/trunk with remotes/git-svn or whatever your git-svn ref is. Push master to my origin remote, which serves as a backup and allows me to collaborate with myself between machines (if you don’t have a Git remote, feel free to omit this). Rebase my current branch against master (and therefore Subversion). The key is item #2: automating the synchronization of master and Subversion means I never have to think about it again. I can either rebase a topic branch against master to get reasonably fresh commits, or use git up to grab the latest (mostly when preparing to commit into Subversion). Without this alias, I tended to waste a fair amount of time switching back to master periodically just to make sure it’s up-to-date enough. When do I git up? 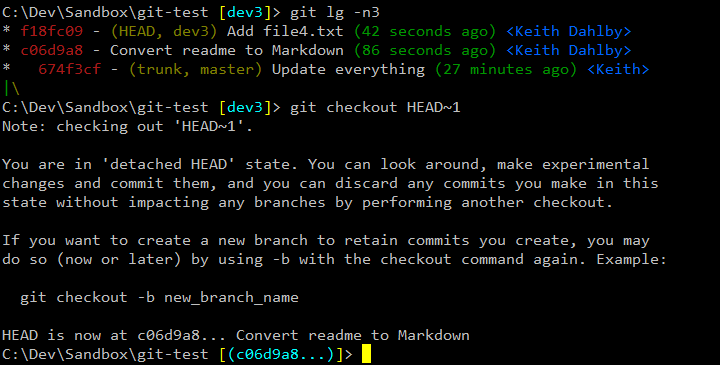 You can use git up pretty much any time you want — on master, on a topic branch or even with a detached HEAD — as long as your working copy and index are clean. If you have work in progress but need Subversion’s latest, you can either git stash or make a temporary commit and then git reset HEAD^ after the update. I used to favor the former, but am starting to prefer the latter because I tend to be undisciplined about cleaning up stashes that git stash pop didn’t delete due to merge conflicts. 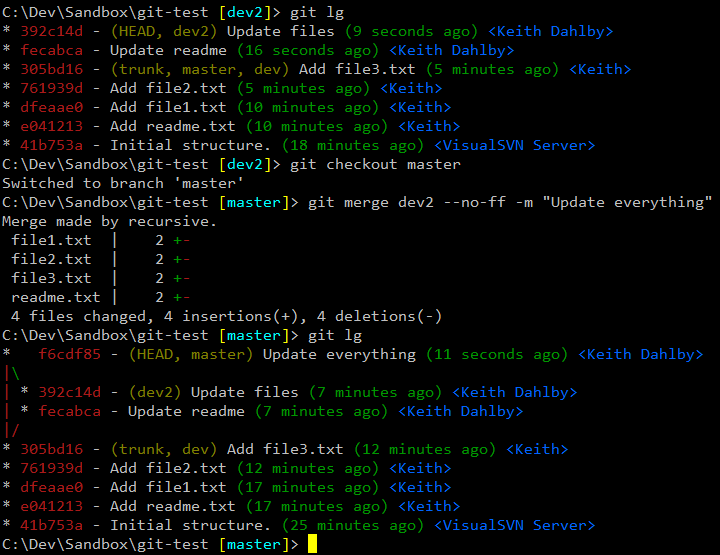 Commit my local changes into Subversion, generating a Subversion commit for each new Git commit. If a modified file has also changed in Subversion since your last update, the dcommit will fail — git up, resolve conflicts and try again. 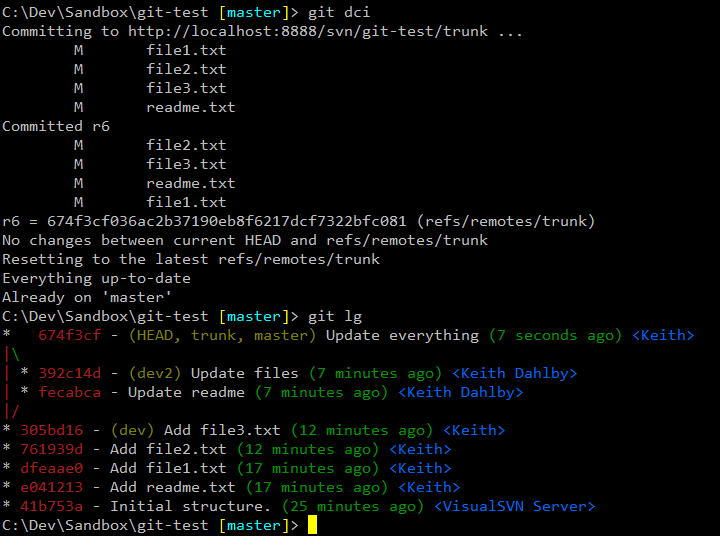 And finally, switch back to master, which will now reference the latest git-svn commit. From here I can either delete my finished topic branch, or rebase against master (git rebase master branch-name) and get back to work. Again, by automating most of what I was already doing I can be confident that I will always come out of a dcommit in a well-known, consistent state from which I can proceed without extra thought. I use this most often, as I prefer granular commits and a linear history. Update Dec. 4, 2010: Donn pointed out that I gloss over my use of an lg alias, which provides a concise graph of history. The alias is described here. The exception to my linear history preference is if the build would break between intermediate commits. For example, I might upgrade a dependency in one commit and then fix the build in the next commit. One could certainly use a squash merge or interactive rebase, but sometimes I prefer to keep the granular history in Git. The --no-ff flag forces the creation of a merge commit even though we should be able to fast-forward (if we up’d first, that is). You can make this the default behavior for master by setting branch.master.mergeoptions (I use --no-ff --no-commit). If I want to get even more sophisticated, I could cherry-pick then dci individual commits, or I could create a copy of the branch and use interactive rebase to exclude the commits that I don’t want to dci yet. Just remember to rebase the topic branch against master when you’re done. If you have any additional git-svn tips or questions, please let me know. How do you handle tagging a release in SVN? Do you handle it within this workflow, or do you have a separate SVN checkout somewhere in which you do your tagging? A Subversion tag can be created from any HEAD known to Subversion (typically master) with git svn tag name, which connects to Subversion and creates a corresponding Git commit all in one step. For repositories cloned with --std-layout, a reference is stored in refs/remotes/tags/name.